Ben's Journal: Review: Martian Notifier - Just How Valuable Is Great Wearable Battery Life? 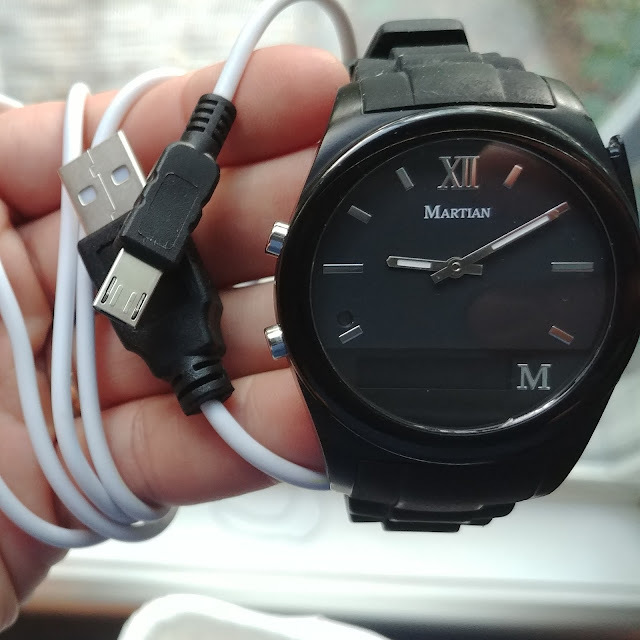 Review: Martian Notifier - Just How Valuable Is Great Wearable Battery Life? A few weeks back I needed to send in my ZenWatch 3 to have a charging problem fixed (the repair was covered under warranty and therefore free). I knew I was going to be without a watch for a few weeks so I decided to poke around and see if there was a cheap device I could pick up in the mean time. In an ideal world, this cheap device would prove hackable and make for a fun future project. Looking around, there are indeed super cheap 'smartwatches' available. But the consensus was: avoid them at all cost. They're such junk apparently, that they aren't worth your time. There was, however, one exception to this rule of cheap devices: the Martian Notifier. I was able to pick up one these for a little over $40, and the reviews promised that it actually worked. Back in the day, the Martian sold for over $100, and it's because of it's age that it's such a steal. On top of the price tag, the watch also promised superior battery life, which happens to be one of my biggest pet peeves of the ZenWatch 3. This isn't a huge surprise, as the Martian has only a tiny one line display and minimal functionality to power. 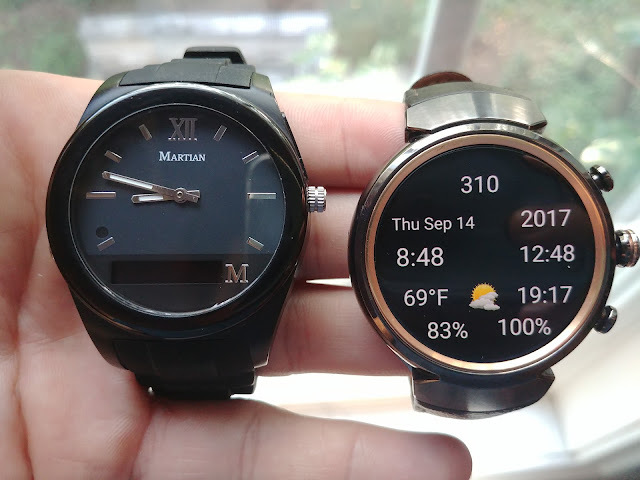 The Martian arrived, I shipped off my ZenWatch 3 and for 3 weeks I embraced the primitive smartwatch life. The biggest pro is that for $40, the device does actually work. Phone calls, e-mails and messages come in, and my wrist buzzes. The device does what it promises. Also, the Martian did deliver on its battery promise. I was able to go days without a recharge, which was especially nice while traveling. And on longer trips, when the battery did completely run out, I was still left with a perfectly functioning analog watch. The biggest con I had with the device was so close to being a pro: the device charges off of a simple micro USB cable. This is awesome, because it means that I can recharge the device in the field using a standard cable. But alas, Martian constructed the device so you need an extra long tipped micro USB cable, not a standard one, to charge the device. So while a typical USB cable looks like it will fit, it doesn't. Another con that was almost a pro: the watch is hackable with Tasker but requires your device be rooted. Like USB cable charging, this is close to ideal, but ultimately, not helpful. Incidentally, it is possible to deliver basic Tasker notifications to the watch, which does provide a level of integration that's easy to achieve. I also have visions of me hacking the watch in the future, but that's another project for another time. One quirk I noticed in the watch is that some text message alerts never make it to the watch. I think this may have to do with RCS or other fancy text messaging facilities that some devices can take advantage of. Unfortunately, Shira's messages appear to fall into this category, so I haven't been seeing those. This is one of the few failures that the Martian Notifier has had, and it's arguably a biggie. For the 3 weeks that I used the Martian exclusively, I found it worked well. It may not have done a whole lot, but what it did do, it did well. I wasn't using my watch to report my location during a run, read poetry or track the mood of my wife, but I wasn't missing calls and (most) messages. With that said, when my repaired ZenWatch 3 showed up at my door step, I gladly swapped the Martian out for the far more sophisticated Android Wear device. The Martian was simple and had great battery life, but ultimately, I'll take the flexibility and functionality of the ZenWatch over it on a typical day. That's not to say that I'm ready to ditch the Martian altogether. Last weekend I went backpacking. Without thinking about it, I left the house wearing the ZenWatch. By the first night, the watch was dead and I spent the rest of the trip wishing I had brought the Martian. Sure, it may not have had the slick features of the ZenWatch, but at least I would have known what time it was. For traveling and other times when battery life is a premium, the Martian is clearly the way to go.